Pearl Aiman Van Sciver, painter and teacher, was born in Philadelphia in 1896. She studied at the Stevens School, the Pennsylvania Academy of the Fine Arts, and the Moore Institute of Arts and Sciences, formerly known as the School of Design for Women. Among her instructors were Leopold Seyffert, Henry B. Snell, Elliot O'Hara, Paula Balano, Lazar Raditz and Violet Oakley. She was an enthusiastic horticulturalist with a beautiful garden and greenhouse at her residence, which became a source for so many of her ambitious, colorful floral still lifes. Other compositions included scenes encountered while traveling in New England, Canada, Mexico and Europe. She was a member of the Philadelphia Plastic Club, the National Association of Women Artists and was Vice-President of the Woodmere Art Museum in 1946, in addition to being a member of many other local and national groups. 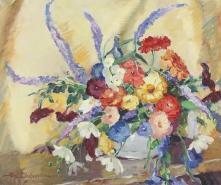 The recipient of numerous prizes and awards, her work was exhibited in Germantown, Chestnut Hill, the Philadelphia Plastic Club, the Pennsylvania Academy of the Fine Arts, Corcoran Gallery of Art, the National Academy of Design, the National Arts Club, and the Argent Gallery in New York in collaboration with the National Association of Women Artists. Ms. Van Sciver's work is in the permanent collections of the Allentown Art Museum, Rochester Memorial Art Gallery, Ogontz Junior College and the University of Pennsylvania. The artist died in 1966.